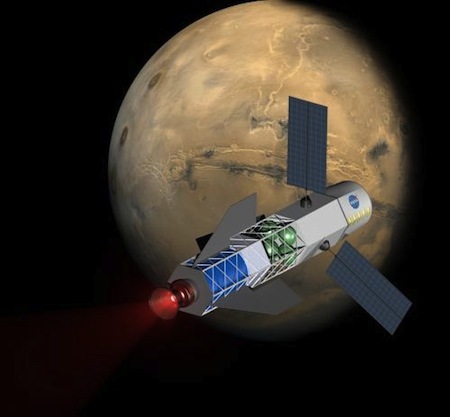 This week, University of Washington researchers and scientists announced their progress in building components of a fusion-powered rocket that could drop the long months required for such a trip to mere weeks. "Using existing rocket fuels, it's nearly impossible for humans to explore much beyond Earth," said lead researcher John Slough, a UW research associate professor of aeronautics and astronautics. "We are hoping to give us a much more powerful source of energy in space that could eventually lead to making interplanetary travel commonplace." Thin hoops of metal are driven at the proper angle and speed for convergence onto target plasmoid at thruster throat. A target Deuterium FRC plasmoid is created and injected into thruster chamber. Target FRC is confined by axial magnetic field from shell driver coils as it translates through chamber eventually stagnating at the thruster throat. Converging shell segments form fusion blanket compressing target FRC plasmoid to fusion conditions. The shell absorbs neutrons emitted during fusion. Vaporized and ionized by fusion neutrons and alphas, the plasma blanket expands against the divergent magnetic field resulting directed flow of the metal plasma out of the magnetic nozzle.